It was to much anticipation that the curtain raised on Sergei Polunin’s Project Satori, the creative vision of the former Royal Ballet dancer whose every step in his career has been under intense scrutiny since he dramatically walked out of the company. Adorned with tattoos across his sculptured body, he is a wonder, an enigma and has been called a creative genius, an enfant terrible, the bad boy of ballet. With such high expectations Satori, even filled with stella cast of beautifully talented dancers, had a challenge to deliver upon the almost legendary atmosphere that surrounds Polunin. The mixed programme opens with First Solo starring Polunin in a 7 minute piece,poignantly about a man who seeks freedom from the dance that enslaves him and his desire to be free. Bare chested Polunin embodies Kaydanovskiy’s choreography as he pours his pain and anguish into the piece as he rolls and thrashes with his internal struggle that is a short dramatic work. The second piece Scriabiniana stars Polunin and the astounding Natalia Osipova, who aim to breath new life into the Soviet-era choreography never before performed in the West, and not performed for 30 years. Created by Kasyan Goleizovsky whose choreography is cited as the starting point for contemporary dance, is a series of 12 pas de deux, pas de quatre and variations. Performed by incredible dancers from top ballet companies around the world that were beautiful vignettes, each with an intimate personal story between the dancers who added their own physical and emotional interpretations to the steps that they weren’t allowed to change in the costumes that had to remain the same. A piece that looked East into the past through the movements of today’s best dancers. 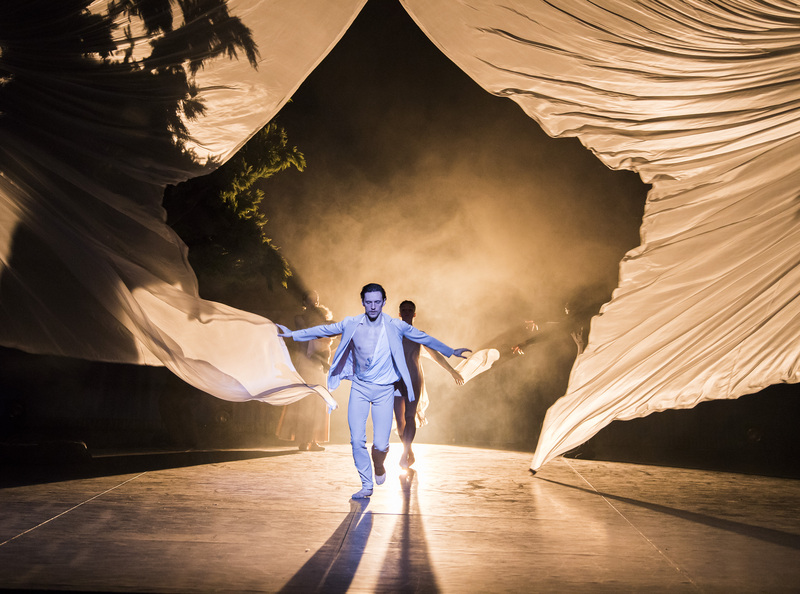 Polunin’s own creation Satori ended the evening with a piece that brought together diverse artists who designed the sound and visual score, but ultimately produced a confusing mix of elements that overshadowed Polunin’s performance. And while those ever high expectations were not met, we have to remember that Polunin is a 28 year old artist who’s set on a journey of self-discovery and not everything an artist creates is perfection. But when the curtain came down and the dancers took their bows, the audience gave Polunin & Osipova and the incredible cast a huge amount of love, so his personal appeal and talent mixed with a dream dance cast was good enough for the audience. Polunin’s Satori runs from 5-10 December 2017 at London Coliseum.